Offering a wide range of soothing, relaxing treatments The Studio is the perfect place to unwind, ease stress and aid rehabilitation. A number of invigorating and energising treatments are available at a highly competitive rate, including Swedish Massage, Body Massage, Remedial Massage, Hot Stone Massage, Indian Head Massage, Lava Shell, Thai Foot Massage and Sports Massage. 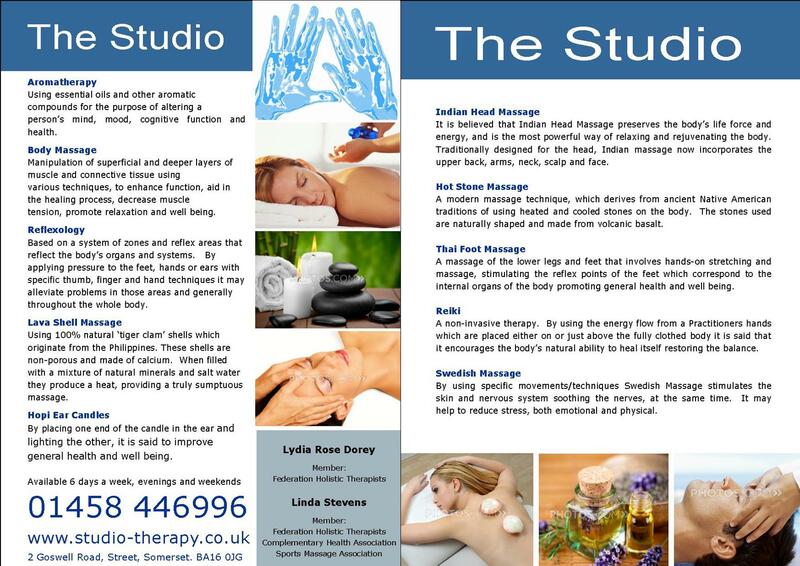 The Studio is situated in the historic village of Street, on the Somerset Levels. The highly-trained, dedicated staff are warm and welcoming. Customers are welcome to call or e-mail with enquiries and questions and a full consultation comes with each appointment. Utilising methods and techniques that have been refined and perfected over hundreds of years, beginning with the Romans and ancient Greeks as well as treatments derived from such diverse sources as Native America and the Orient, The Studio combines traditional holistic remedies with the latest in modern physiotherapy. Massage therapy can decrease both physical and emotional stress, boost the immune system and aid circulation without placing stress on the heart. As well as general treatments designed to either relax and sooth, or invigorate and energise the body and mind, more selective treatments are available to target specific problems and provide pain relief and increased mobility.